This is an (H-a,R)RGB image of the Flame Nebula near Zeta Orionis (Alnitak), the leftmost belt star in Orion. The blue reflection nebula in the upper right corner is IC342. North is to the left. The framing of this object was selected to show the gradation from the reddish/yellow color of the Flame into a fainter blue relection region below (east). The Flame Nebula is 1,500 light years distant at the edge of the large Orion molecular cloud. These are dense clouds with hydrogen atom densities of >1,000 atmos/cm3. They are the places of new star formation. Nearby massive O and B stars that are very hot, bright and emit ultraviolet radiation strip electrons from atoms such as hydrogen leading to the emission of red light in case of hydrogen (HII or H-a) at 656 nm. Sulfur (SII) emits light at a deeper red wavelength of 671nm and doubly ionized oxygen (OIII) emits light at two adjacent lines with the main emission at 501 nm and a subordinate emission at 495 nm. 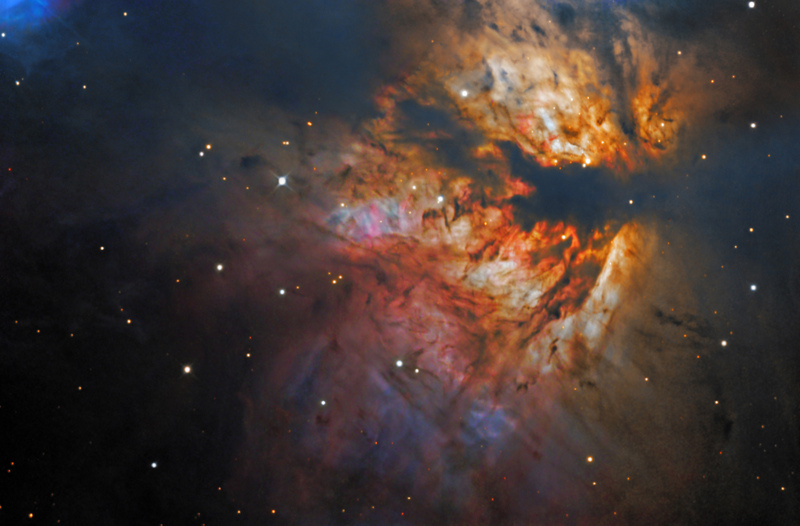 The prominant dust lane most likely obscurs a cluster of young stars seen at infrared wavelengths that are the energetic source of the ionization in the flame nebula.